Research Proposal Topics often emerge from interesting case files. History is full of such folk. The giants like Madam Curie, and Rontgen and Galileo but today there are many millions of unknown people contributing their own mysterious anecdotes. It all starts with an observation. For example, I have noticed that patients who do a quad setting exercises can polish off the crystals that grate and cause pain under the kneecap; but that doesn't make it fact, especially as I also use other chiropractic procedures. Perhaps it's them that are affecting the changes in the chondromalacia patella. It's now totally accepted in the scientific community that anecdotes like I took 1000mg of vitamin C for three days and it cured my cold have absolutely zero worth; or, I have three friends who will swear on the Bible that if they stop their glucosamine chondroitin sulphate pills their pains get worse. Or, I went to the chiropractor and she cured my lumbar stenosis, or my this or that; it's all worthless. To turn an anecdote into a fact accepted by the scientific community takes meticulous study. Upper lumbar spine radiating to the anterior thigh is well documented, but there are several different neurological routes that may occur, one via the various branches of the femoral nerve, each providing a different feature, or via the superior cluneal nerves which radiate to the upper buttock and according to some authorities the groin too. Cases are often complicated by more than one focus of pain; there is frequently also lower lumbar pain, or a sacroiliac condition, or an impingement syndrome in the hip for example, making this a very complex syndrome. Upper lumbar thigh pain case file. Murky science sometimes deliberately confuses matter by fiddling the statistics. This sacroiliac joint case file below is simply an anecdote. What is the frequency of this concrete fixation? Is it on the same side? Are there other signs? Are the sacroiliac joint tests positive? Does chiropractic have a contribution to make? There are so many research proposal topics that we could and should test. Having said that, it's vital that we use honest science to underpin our theories. Murky science only muddies the water and brings both scientists and their professions into disrepute. The sacroiliac joint is a prime mover, as is the hip joint, in bending, walking, leaping; they work in harmony each contributing to a fluid body movement. Hip surgery sometimes fails, not because the hip surgery was poor, but because the sacroiliac joint was not also addressed. Also, hip surgery often dramatically changes leg length, as in this sacroiliac joint case file. The patient after surgery had a 10mm leg length deficiency leading to hip, sacroiliac joint and back pain. There's much room for more research proposal topics when it comes to the sacroiliac joint and hip arthritis. Whilst slipped discs like this case file are routine, every day affairs in chiropractic clinics, one is always aware that we are treading on thin ice; a wrong move can spell disaster. A sneeze, a low chair, or in fact any sitting at all, or an unwise move by the doctor can often aggravate the condition. For example, it took me many years to realise that a roll technique for the sacroiliac joint will often aggravate a fourth lumbar disc condition. Personally, I always take extra special care with the patient experiencing an acute injury for the first time. Careful and correct management of the this person, be it a slipped disc or some other condition, will usually mean that the repeated episodes that lead inexorably to surgery can be avoided. Never to be forgotten by both doctor and patient is that it takes at least six weeks for the annulus fibrosis to heal, under ideal circumstances. In other words, long after the pain has usually passed, the spine remains vulnerable to a relapse. 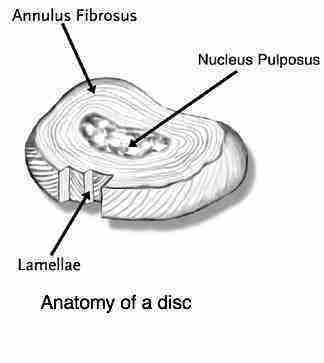 This is particularly true of the medial disc; easy go, and readily comes straight back. we believe it to be true. some authority whom we trust says it's true. it stands to reason and it makes sense, therefore it must 'a priori' be true. objective methods outside my realm of influence have been used to demonstrate the truth of it. There is much debate amongst chiropractors about the vertebral subluxation complex; some suggest that it lies in the domain of belief rather than the scientific method. Just when should one X-ray after trauma? With football players, offroad motorcyclists, horse riders there is trauma every weekend. You can't X-ray the patient every Monday morning. There's no substitute for the careful, thorough chiropractic examination, as in this Thoracic spine pain Casefile. Whilst the "fracture" Spondy is often stable, the "degenerative" spondylolysthesis if far more challenging to both clinician and patient, especially when associated with a short leg, further trauma, or a position that requires long hours of sitting; perfect material for our Research Proposal Topics. Whilst there is very strong research now confirming that manipulation is the treatment of choice for lower back pain, the evidence for neck pain is less strong. What's interesting is there is absolutely no research confirming that surgery helps neck pain. So we both, surgeons and chiropractors have work to do... Research Proposal Topics. Does a heel lift help with neck pain if there's a short leg? Read more from this neck pain anatomy CaseFile. # What causes headache CaseFile? Headache management is always challenging. Finding the right combination of adjustments of the cervical spine is never easy. Posture management, the correct position of the monitor and mouse, a sloping desk for the student. The Tempero Mandibular Jaw Joint too has sometimes a vital role to play in Migraine headache. WHAT CAUSES HEADACHE CaseFile keeps every doctor on his or her toes. Migraine headache is a challenge to every physician; do you have jaw joint pain or popping sounds, or do you grind you teeth at night? Pain in the back of the thigh, groin and front of the thigh are common complaints in the Chiropractic clinic during examination of the pregnant patient. Does chiropractic have a role to play? Complaints like this leg pain during pregnancy CaseFile will make your doctor earn his fee. Chiropractic physicians (and presumably our medical colleagues, too) have long been puzzled by finding arthritic-type signs in the examination of the YOUNG hip. A hard "end-feel" definitely comes as a surprise when examining the young adult. Fairly recently the condition Femero Acetabular Impingement Syndrome FAIS has been declared: what has for years been declared as "normal" by radiologists was in fact anything but normal. The extra deep acetabulum, the over hanging Pincer and the ominous CAM deformities constitute FAIS. Fortunately the condition responds magnificently to chiropractic management. How magnificently? 10%, 90% of the time? Research Proposal Topics. Do nothing? Start to prepare for a life of hip arthritis. Read more from this femoro acetabular impingement syndrome case file. Moderate and severe cases of DDH are usually detected at birth by the paediatrician, or chiropractor attending to a case of Infantile Colic. The tests for HIP DYSPLASIA Ortholani Galeazzi and Barlow are relatively standard. The hip gives a distinctive low-pitched "thunk" as it dislocates. Pain in upper leg, groin pain, hip pain can be very disconcerting. Walking may become very painful, nights are disturbed... PAIN IN UPPER LEG ..
To my knowledge there is no research proving that Chiropractic is effective for Carpal Tunnel Syndrome, yet I get great results with the condition. It is of course well known that we egoists remember our successes, but are very short on memory when it comes to our failures. Only scientific examination can distinguish between fact and fancy! Looking for good research proposal topics, doc? Anomalies at the lumbo-sacral junction are relatively common in the clinic setting, presumably because of a greater incidence of low back pain. Often they don't respond well to conventional chiropractic care and the treatment has to be modified to accomodate the anomaly. L4 LUMBAR SPINE CaseFile tells the story of a young woman who had a serious skiing accident eleven years ago. She struggled for eleven long years with this condition. Physical therapy helped in the beginning; physiotherapy and antiinflammatories brought minimal relief. This particular case is a remarkable success, but to turn this anecdote into scientific fact... will take a lot of blood, sweat and tears by men and women with an enquiring mind, incredible patience, and staying power... can we reliably predict that Chiropratic can help 10% of such cases? 50%?, 80%. We just don't know. And we need to know, so I'm hoping there is a chiropractor out there looking for persuasive research topics! Few things are more clinically challenging that the patient suffering from degenerative lumbar disc disease. Yet every chiropractor will tell of patients with severely arthritic spines who have responded well to Chiropractic. But... how often. 2% of the time? Or 92%? A degree of arthritis in the lower back is normal in the 69-year old. It's just wear and tear of a lifetime, and quite to be expected. However, in certain situations, it can be greatly exaggerated: A scoliosis, curvature of the spine, as in this case, places increased stresses on the joints. An injury. Falls down the stairs, on the ice, from a motorcycle often leave their mark. Immobilisation arthritis. Immobilisation arthritis explains why fixated joints become arthritic. So often it all starts with the foot. This young lady from our ankle joint pain case files consulted me for low back pain and headaches. But the root cause of her problems was a fall down a Dutch staircase, eleven years ago, seriously fracturing her talus bone. She walked on the toes of her right foot for eleven long years, unable to place her heel on the ground, despite massive orthopaedic intervention, including several operations. But can chiropractic reliably contribute to miracles like this case? Or is this a one off anecdote? Only an intrepid chiropractor, looking for persuasive research topics, can provide the profession, and you the public with the information we need. A colleague gives us our second ankle joint pain case file; and this surely wouldn't make for controversial research paper topics. Top athletes have been demanding the presence of chiropractors at the world athletic games and the Olympics in the last decade. An injury to the foot changes the gait, invariably with a knock on effect in the pelvis and spine. 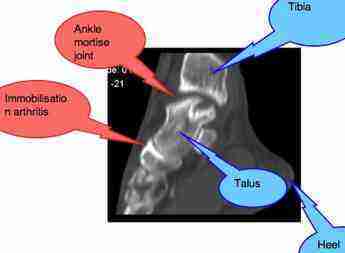 ANKLE JOINT PAIN CaseFile ... a very serious fall. Ankle joint pain Case File ... an acute runner's ankle. A vertigo case file is a controversial addition to research proposal topics; cervical adjustments are not the treatment of choice and perhaps should be red flagged. The Epley manoeuvers are the treatment of choice in every vertigo case file. HOW MUCH FISH OIL for healthy bodies and cartilage? Chiropractic East London in South Africa.